Subjects for close-up and macro work are plentiful all year round, and readily available in your garden, local park or streets. But it is technically challenging. 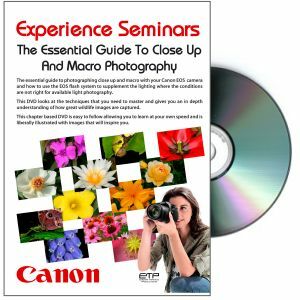 This DVD will enable you to get a firm grasp on the theory and application of close-up and macro photography. Close-up and macro are often the hardest areas of photography to master. This DVD gets up close and personal with the subject matter. Learn why there are different techniques for the two areas and develop your understanding of flash and relevant equipment to get the best results. As with other titles in the series, this DVD is relevant to all EOS digital cameras. It also looks at what equipment is available and techniques for better framing and composition.